Accessible Ticket Policy: General Admission Accessible Tickets/Seating is on our Concourse Level. Access to this level is easily located through the elevator in the main lobby. Level 100/200 Handicapped Seating tickets can be purchased at main ticket gate and staff will make arrangements to assist fans down to 100/200 level entry gate past the first base ticket office. Accessible Parking: There are a number of reserved parking spaces that are available on a first-come, first-served basis. Please notify the parking staff of your desire to park in the reserved accessible area. Proper handicapped ID is required. Alcohol Regulations: All persons purchasing alcoholic beverages must have valid photo ID and be twenty-one (21) years of age or older. It is unlawful to purchase alcohol for minors. Behavior: Syracuse Baseball is a family-oriented experience; we ask that the behavior of our fans be in accordance with this atmosphere. Therefore, the use of disruptive and vulgar language or gestures is prohibited. If your enjoyment of visiting NBT Bank Stadium is being interrupted, please contact ballpark security or an usher. Cameras: Fans are permitted to use both still and video cameras to shoot pre game, game action and between innings as long as they are not obstructing the view of other fans. Tripods and other camera stands are prohibited. Charging Station: For your convenience, the Mobile Charging Station sponsored by syracuse.com and the post-standard is located behind section 202 on the main concourse. Child Ticket Policy: Children two (2) years old and under are admitted to NBT Bank Stadium at no charge for Syracuse games as long as they do not occupy a seat. Children three (3) years old and over require a ticket for admittance to the ballpark. Credit Cards: All concession stands and the Syracuse Met's Team Store accept the four major credit cards (VISA, MasterCard, American Express and Discover). Family Fun Park: The Driver's Village Family Fun Park is located behind the right field wall. All activities and games are FREE. Family Sunday Policy: KIDS 12 and under EAT FREE on NBT Bank Family Sundays and can run the bases after the game courtesy of St Joseph's Health! First Aid: Fans in need of medical assistance should inform a security officer, Syracuse staff member or usher immediately. Emergency medical service is available on the Main Concourse behind Section 210. Food & Beverage Carry-In Policy: No outside food or beverage is allowed in the stadium and all bags are subject to search. Gate Openings: NBT Bank Stadium gates open one hour before the start of each ball game unless otherwise advertised. 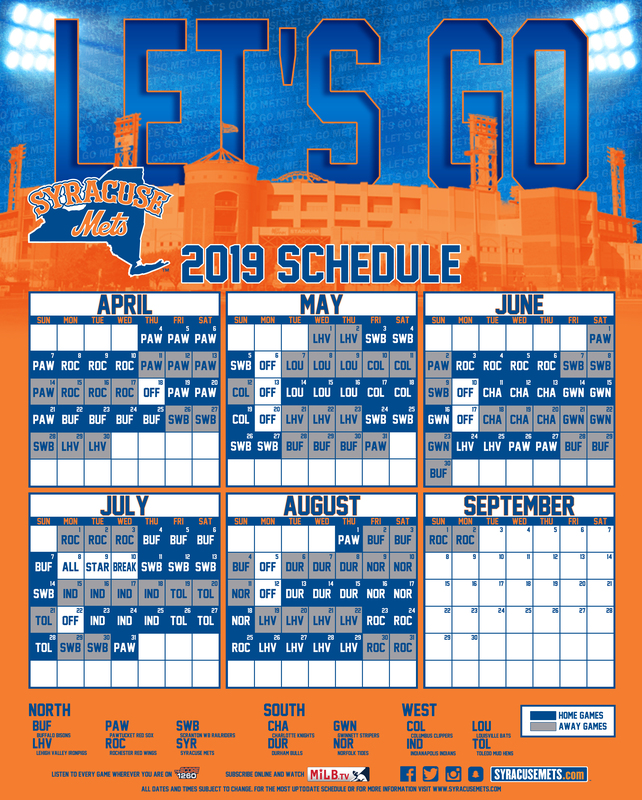 Gift Shop: The Syracuse Mets Team Store located behind section 205 is open during all Syracuse home games. Guest Services: Birnie Bus Guest Services is located on the main concourse behind section 204 right next to Vinny's Original Pizza. Lost and Found: Fans who have lost or found an item should report to the Birnie Bus Guest Services located behind section 204. Lost and found objects will be stored there where they are kept until claimed. Lost Children: Lost children should be escorted to the Birnie Bus Guest Services located behind Section 204 on the Main Level. Parents trying to locate a lost child should contact guest services or security. Lost Tickets: Season Ticket holders may obtain a special duplicate ticket by visiting our ticket office. Your tickets will be reprinted and your lost tickets will be voided out in our system. Peanut Controlled Area: Section 218 is for fans with peanut sensitivities. Just mention the peanut controlled area at the ticket office and you will be seated in section 218 with a great view of the game from the 3rd base side of the ballpark. Pets: Pets are not permitted in the ballpark except for the fans requiring the use of guide dogs or during Bark in the Park Days at the Ballpark. Postponed Games: There are two types of cancellations: Game in progress postponed: If this occurs keep your ticket stub and redeem it at the ticket office for a future game subject to availability and excluding special events. Please be advised, this transaction does not have to take place on the day the game is postponed. By International League rules, five innings (or four and a half innings if the home team is leading the game) constitutes a complete game and no ticket refunds or rain checks will be issued. In the event a double header is postponed after five innings of game one have been completed, it will be considered a complete game. No refunds or rain checks will be issued. Postponed Game-- before gates open: If this occurs, keep your whole ticket and exchange it at the ticket office for a future 2018 game of your choice, subject to availability and excluding special events. Radio Broadcasts: WSKO THE SCORE 1260AM is the flagship station for Syracuse Baseball broadcasting all 144 games. Radio-Personal TV's: These items are allowed in the stadium, as long as their use does not disrupt other guests. Rain Delays: The umpire-in-chief shall be the sole judge as to when play shall be suspended, as well as when a game will be resumed or terminated after such suspension begins. An umpire must wait a minimum of 45 minutes after a suspension begins before making a determination on postponement or termination. A rain delay may continue as long as the umpire believes there is any chance to resume play. Restrooms: All restrooms are equipped to serve physically challenged patrons. Please take caution when entering bathroom as floors may sometimes slippery. Re-entry: There will be no re-entry into the ballpark, except in case of emergencies. Safety: Our nets have been extended to the ends of each dugout to increase the safety and game experience at NBT Bank stadium. Please be aware of bats and balls that exit the field of play! If you feel unsafe please ask us to move behind the netted area and we will make the proper arrangements. Season Ticket Holder Guaranteed Giveaway Policy: Season ticket holders must come to game to be eligible for guaranteed game day giveaway. Late arrivals should show their season ticket membership card to a staff member at guest services. Security: Ballpark security officers are trained and located throughout NBT Bank Stadium. Smoking Policy: NBT Bank Stadium has two designated smoking areas. One is located near the exit ramp on the first base side; the second is located on the third base side located near the exit ramp. Smoking Policy applies to electronic cigarettes as well. Soliciting: Soliciting of any products, services and/or monetary donations in or on NBT Bank Stadium property is strictly prohibited. Violators will be escorted from the property. Suite Rentals: A limited number of luxury suites are available for rental on a game-by-game basis. Ticket Resale Policy: Under penalty of law, tickets may not be resold by an unlicensed vendor for any dollar value within 1,500 feet of NBT Bank Stadium. This also applies to the resale of tickets below face value prices. Ushers: Syracuse ushers are situated throughout the seating areas to assist you with your seating needs and to make your visit to the ballpark more enjoyable. If there is anything interrupting your enjoyment, please ask your usher for assistance.